Rarely do I ever suffer feelings of FOMO (fear of missing out), yet when I found out a couple of my good friends were planning to lose their Coachella virginity this month, I admit I felt just a tinge of jealousy. I still remember vividly my experience from last year: the flower crowns, flowy dresses, fringe, and colorful prints. Yes my friends, I have festival fashion FOMO and the only cure for it is more boho. Luckily I found my fix right under my nose, hanging in my closet. This handmade vintage dress makes me feel groovy but elegant, youthful yet mature. With a stylized paisley floral print bursting in a melange of vivid colors, it only seemed right to accessorize accordingly, else do the dress injustice. 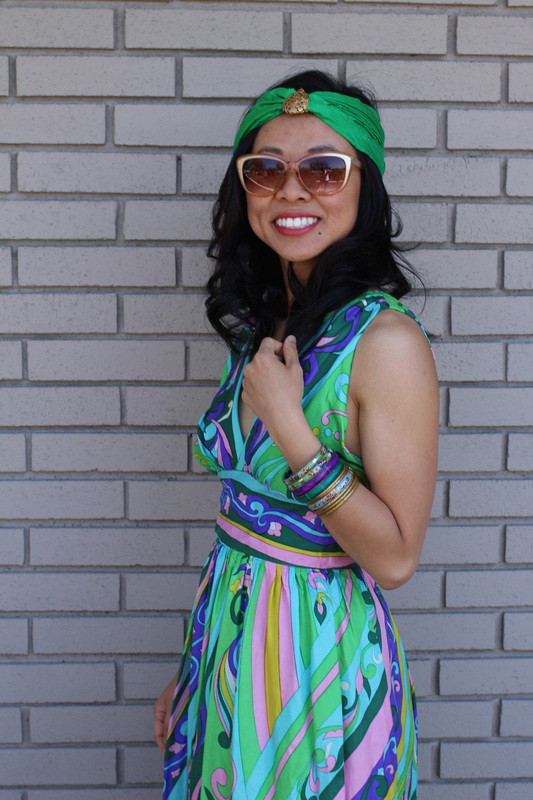 An urban turban and an arm chockfull of bangles fit the boho bill quite nicely. Sometimes I wonder about who made and wore this dress, and to where did she wear this psychedelic beauty? Perhaps to a music festival in the 60s or 70s? Whoever she was, she is my body twin and style soulmate. Wearing this dress takes me back into time and that’s better than any overpriced Coachella weekend. Peace out FOMO! I guess you can call me a beautiful little fool for attempting to rival the looks of Ms. Daisy Fay. After all, she wears the finest pearls that money and buy and has two men vying for her love. Who wouldn’t be jealous? Perhaps one of the most popular fashion decade amongst vintage experts and amateurs alike is the flapper style of the Roaring 20s. The style of this decade consisted of shapeless shift dresses with boxy straight cut silhouettes. Gone were the constricting corsets of past eras, and this was the first time there was so much exposure of the arms and legs. Shoes also became important in the outfit, as they now were visible because of the shorter hemlines. Mary Janes and T-straps were the popular shoes of this era, with their aesthetically pleasing design and practicality for dancing. After watching The Great Gatsby, I was inspired to get jazzy and celebrate the 20s while I am still in my 20s. I got this awesome sequined wool top during my solo trip to Toronto a few months back. Not only does it shine and sparkle under the lights, but also when I move, the sequins rustle like the sound of leaves blowing on the treetops during a breezy autumn day. I wore it over my LBD, and with my already boyish figure, I suddenly created a flapperesque silhouette of a dress. Add some gold T-strap heels and a velvet turban headband (I used a strip of fabric scrap), and I am ready to do the Charleston all through the night. I probably could’ve used one strand – or ten – of pearls, since the 1920s look isn’t complete without tons of costume jewelry. Oh, what a fool I am! Itemize deductions? Report investments? Self-employed? Tax season can be quite taxing. Luckily I have my own CPA to take care of the nitty gritty for me. This year I actually got a refund from the IRS. Which means its time for some IRS -Impulsive Refund Shopping. I’ve been on the hunt for a vintage Coach handbag for some time now, in particular, the Willis style handbag. My weapon of choice: Ebay, the world’s largest thrift store. To be an Ebay bidder, one must have incredible patience, be willing to ask questions, cross-examine photos, and be able stay calm in the event you are outbid. But how much am I willing fork over? With my refund directly deposited in my bank account, I sought out many sellers, lost some bids, but finally my patience paid off. When my baby Willis arrived in the mail I actually jumped for joy and immediately transferred all the contents from my old purse into my new old purse. It’s the perfect size, and the handle + long cross-body strap is so functional. Still afraid of shopping on Ebay? Don’t worry; Coach has got your back. Called the Legacy Collection, Coach has brought back these old styles – but you will have to pay a pretty penny of course. My favorite style is the Willis because of that little handle at top and its “just right” size, but I love all their other designs as well. I recently went on a shopping trip with some gal pals in San Francisco’s Mission district. In usual San Francisco fashion, the weather was slightly overcast and windy with a chance of rain. The key to dressing for this is to think like an onion: dress in layers. Start with a casual tee, then a chunky middle layer (I chose an oversized cardigan), and finish with an outer shell. Since it wasn’t too cold, but I needed to be concerned about the possibility of rain, this olive windbreaker was just the right fit. Still riding on the high of my urban turban, I pulled a leopard version of it to disguise my unruly hair. Finish with the perfect Willis handbag. That’s a good one coach! Now go do your taxes, you procrastinator you.